It’s a sad, but true fact of life that you don’t have to look long to find bad examples of customer service. Think of some bad customer service you’ve experienced lately. How did you feel at the moment? How do you feel now about the business or persons involved? Would you ever be guilty of something similar in your territory? What you may have noticed about poor customer service is that the parties responsible for it are often clueless as to how they’re making the customer feel. Let me give you a recent example. I needed to repair an oil leak on my car. Unfortunately, fixing the leak required removing the entire engine from the car and partially disassembling it to get to the part that was leaking. The cost was about $150 in parts and over $2300 in labor. It seemed to me that the only choice for the job was the service department at the dealership. I expected them to have the right parts, the right tools, and technicians with the skills and experience to fix the car. I called my service writer at R****** , which is the dealership that has serviced my car since it was new. I left a voicemail message at 8:30 am to return my call so I could schedule an appointment and find out about a loaner car, as the job would take 4 days. I didn’t get a call back that day…or the next day. So two days later, I called again and left another message. Same result—two days go by and no return call. I called the dealership and asked to speak to the service manager. He was unavailable, but you guessed it, the operator wanted to put me into…voice mail! Instead, I asked if she could take my contact information and have him call me. He never did. I called again, but was told the manager was in meetings. Getting the impression that R****** didn’t want my business, I visited some other dealers. Either the experience was worse than R******, or in one case, I was quoted almost $800 more for the same repair. After stewing for a week, I called R****** and asked the operator if she could walk over to the service department and get Andy, my service writer on the line. She did. When I told Andy that I had left several voice mails, he said he had no record of that. While I’m a little skeptical, technology has its foibles, so it’s possible that he never received them. Anyway, I had him on the phone, he was pleasant and made the arrangements for the repair. I brought my car in Monday morning where I was eventually provided with a loaner car after a bad customer service experience at Enterprise [links to previous article]. Late Thursday afternoon, Andy called me to tell me my car was ready. I said I would be in first thing in the morning to pick it up. It’s Friday morning. My plan is to return the loaner car, pick up mine and grab some breakfast. I arrived at the dealership, forked over $2600 plus change and headed out to the parking lot to reclaim my car. When I opened the car door, the first thing I noticed were greasy palm prints on my beige leather door panel. I had a similar experience with R****** in the past where my car was returned dirty and remembered that the shoulder harness was really bad. I looked at the shoulder harness and noticed a bit of grease on the part that was showing. I pulled it out to discover that it had numerous greasy palm prints along it’s length. Needless to say, I wasn’t too happy, especially since I had dealt with this before at the same dealership. I walked back into the service department to find Andy. He had someone take the car away to clean it up. After about a half hour, they again told me the care was ready. Andy said he would have the interior detailed at no charge the next time I brought it in for service. That seemed fair and I just wanted to get some breakfast. Upon getting into the car, I saw more grease spots I hadn’t noticed before. There was grease on the leather part of the steering wheel in numerous places. I saw some dirt on the driver’s side of the beige leather gear shift knob. I decided to poke my head around to look at the other side of the gear shift knob. It was black—covered in grease. Not too happy, I walked back into the service department to find Andy again. I asked him to bring the service manager out. I felt that he needed to see this. How could a professional auto mechanic be so clueless as to get into a light colored interior car with grease on his hands? All he had to do was wash them, remove his dirty gloves, or put on clean gloves. But no, he wasn’t thinking about that or he didn’t care. I replied that I didn’t want a loaner. I wanted my car. And I considered it an insult that the service manager wouldn’t take the time to meet with me. I told him to clean up the car. I would wait. So, what does this have to do with medical sales? When you tell a customer a job is done, i.e., a case is set-up, an evaluation unit is in place, whatever it is —make sure you check it thoroughly so you know it’s ready to go inside and out. The customer should never be the one to discover flaws in your product or work. That’s your job, regardless of who actually did the work. It’s your territory; own the outcomes. Andy should have personally inspected my car before telling me it was ready to go…three different times when it wasn’t. 2. When you go to fix a problem, consider how it’s going to inconvenience the customer. Andy wanted to put me in a loaner and have me return later that day or the next day to get my car. I live 30 minutes from the dealership. He didn’t consider my time; he was just trying to get things done, which I understand, but he never asked what would be best for me. 3. When there is a problem, acknowledge it and own it. Bring in a manager or other higher up to let the customer know you take the situation seriously. If the manager is not immediately available, take control of putting the manger and the customer together. 4. Apologize for the inconvenience and the mistake. Tell the customer specifically how you’re going to make it right, and more importantly, how you’re going to ensure that it never happens again. 5. Customers will judge you and your company by how anyone and everyone in your organization treats them. Part of your job is to make sure everyone else, including management, is doing their job. At the heart of customer service (in any industry) is this: When a customer has a problem, take the problem away from the customer and make it yours. That’s what you get paid to do. Companies, their employees and sales representatives exists for one reason: To serve the customer. The customer should never be treated as if he or she is imposing by expecting things to be done right. I chose to have my work done by a dealership because I wanted my car repaired by professionals. Hopefully, the work was done correctly, but I’ll always wonder because I believe that how you do anything is how you do everything. My experience tells me that this company needs to pay more attention to detail. 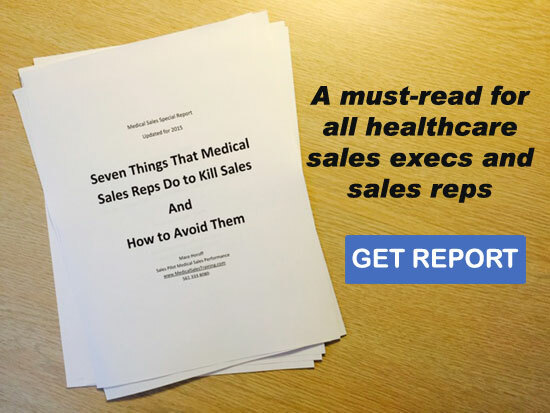 In the healthcare world, this type of customer service behavior is unforgivable… and it’s also the kiss of death for medical sales representatives who don’t pay attention. The customer is never an inconvenience; The customer is the reason your job exists. Customer service is often the lynch pin sustains a business and it’s never good enough until each and every customer thinks it is.